Although I’m a 70’s/80’s child, I have to admit that I enjoyed watching Kelly, Slater, Zack, Lisa, Screech and Jessie make their way through high school (and the College Years) during the 90’s. And we’ve told you about games by Pressman before, including a nod to the 80’s in their card game based upon the PC game, Oregon Trail. 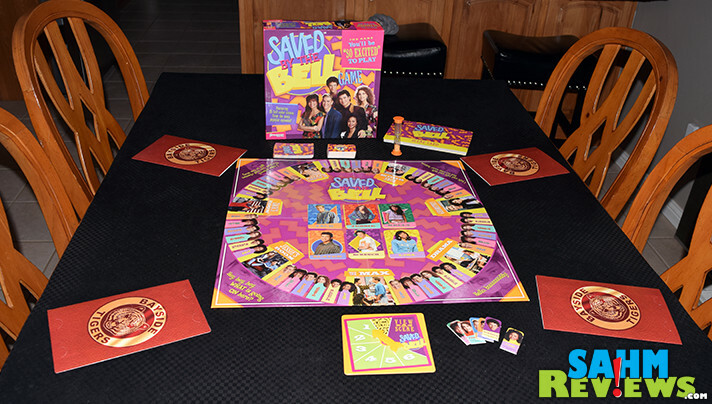 When we first saw the press release about their brand new Saved by the Bell Game, we were “so excited” to have a chance at trying it out! 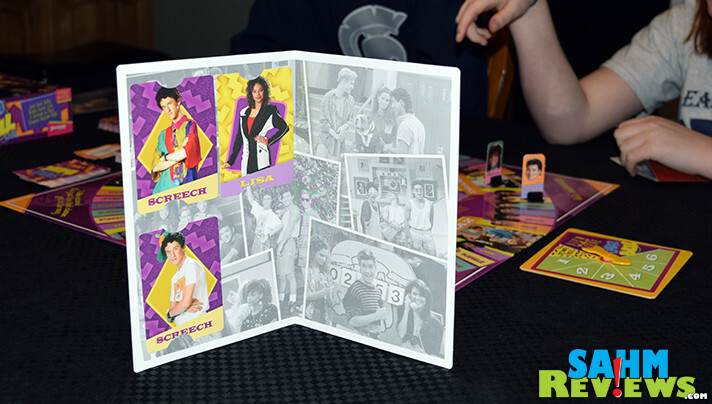 Saved by the Bell Game is a memory game designed for up to six players ages 8 and up. Each player takes on the role of one of the show’s main characters and receives a standee of that person and an empty Yearbook Card Holder. 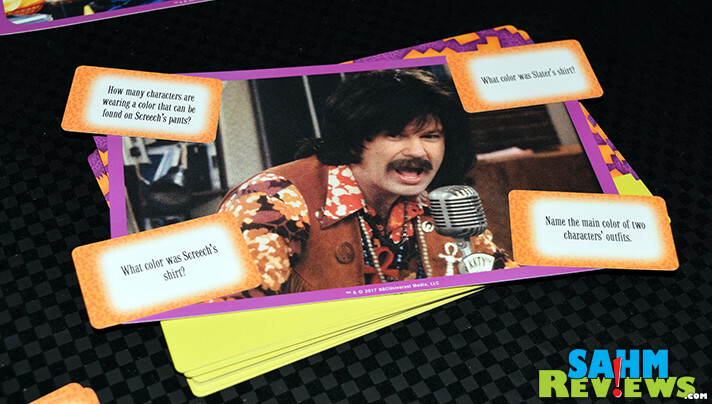 Your goal is to fill up your yearbook with photos of all six characters or three of the same character. 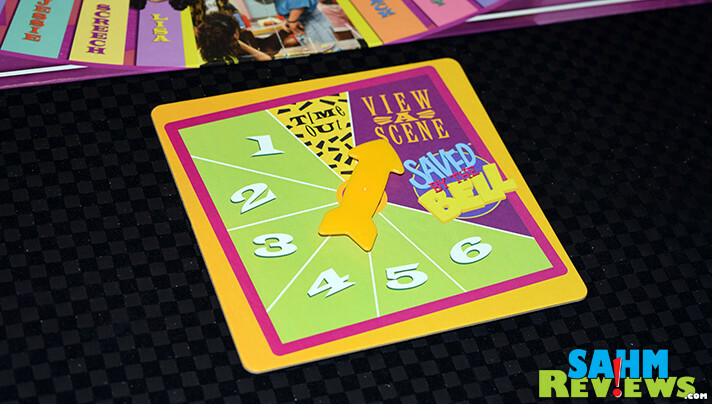 In what I guess you would also call a throwback, Saved by the Bell Game includes a cardboard spinner for movement. On your turn you spin the spinner and either move forward the matching number of spaces on the board or resolve the other two spaces it can land in. 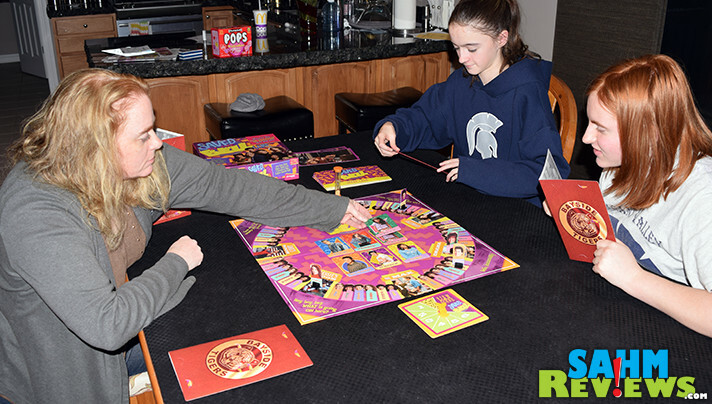 If you land on a character space you may either pick up a Character Card matching your space from the center of the board (if there is one), or discard that Character Card from your yearbook and pick up any other from the board (or draw one from the top of the stack) and put it in your yearbook. If you land in one of the bedrooms, The Max, the classrooms, Mr. Belding’s office or spin “View a Scene”, the memory part of the game begins. The active player reveals the top scene card featuring an actual frame from one of the more famous episodes and turns over the timer. Everyone has that amount of time to study and memorize the details on the card before the timer runs out and the card is turned back face down. Each player is then dealt a Question Card and will (in player order) be asked to answer the question correctly. “Describe what is happening in this scene”, “Where did this scene take place” and “What characters are wearing floral patterns” are but three of the dozens of possible questions posed. Once everyone has locked in their answers, the Scene Card is turned over and all answers are verified. If correct, you are allowed to draw one card from the top of the Character deck. When your spinner lands on “Time Out” you are allowed to steal a Character Card from any opponent! Choose a player, who then removes all of their cards from their yearbook, shuffles them and deals them out face down to the table. 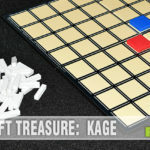 You then select one at random, with the rest being returned to the other player. 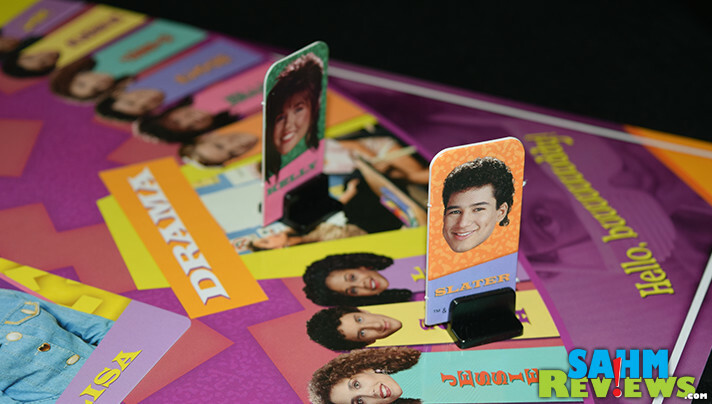 The first player to either collect one each of all the different characters or three of any one character wins Saved by the Bell Game! The rules don’t specify, but we played as you can only hold as many Character Cards as allowed by the yearbook. If you gain additional cards, you must discard until they all fit in the book. Additionally, many of the drawn questions had nothing to do with the photo itself, making answering easy, but confusing. 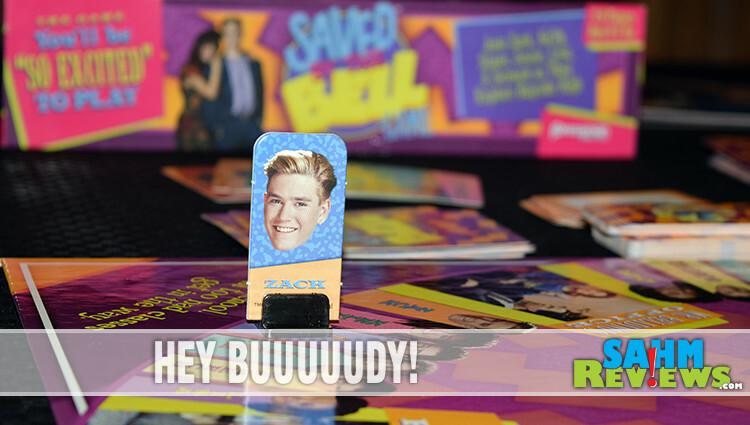 We did find it ironic that Saved by the Bell Game is a memory game about a show from the 90’s – an age where many of its viewers are admittedly beginning to have memory issues! Originally a Target-exclusive game, copies can be found on Amazon for around the same price. 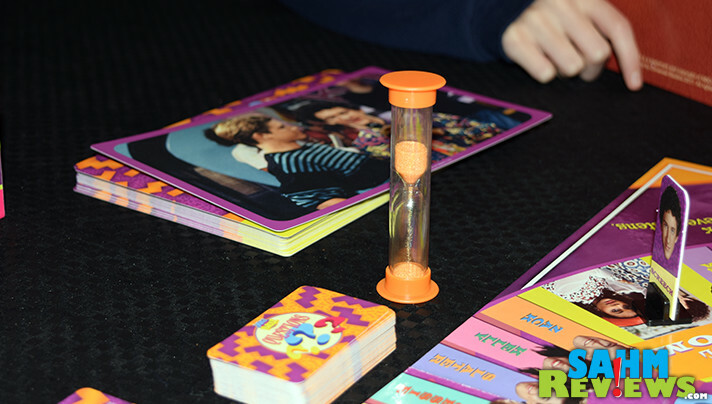 Saved by the Bell Game might be a good one to play with your younger kids to help with memory skills while having a theme that is of interest to you. Check out Pressman’s website for other game ideas and watch their Facebook and Twitter feeds for new product announcements! Ah, I loved the TV show back in the day! 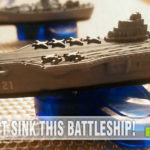 This would be really fun to play with my kids, we are always up to try a new game out! I am getting this for my best friend for her birthday! She is going to flip. Thank you for the gift idea. Wow this is so much fun I was used to loved that program. 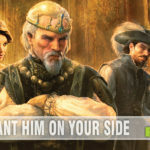 Need to buy this game! Back in time when my kids were young! Oh my! Is this the blast from the past! My girls had such a crush on Zack!! Mr, Belding was really a thorn in their sides. My daughters would love this game. Is this like a trivia game or a memory game? All I know is that they would probably remember every bit of the Zack card. Of course, they will remember the rest of the gang: Lisa, Kelly, Slater, Zack, Lisa, Screech & Jesse. Hopefully they can finally get these characters through school!! This game would really bring a couple of chuckles and more if I bought it for my two daughters who are in their forties! Thank you for sharing and I have to pin this!! Funny to see this – I remember my son watching this show when he was younger. He would probably have a blast playing this. Another flash from the past my son will love!